Product #46012 | SKU DT85 | 0.0 (no ratings yet) Thanks for your rating! 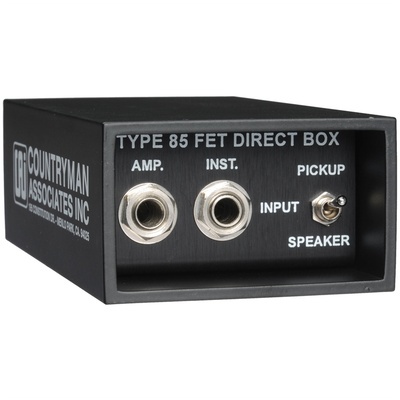 The Countryman Type 85 is a compact direct box that connects instruments with high impedance pickups, such as piezo pickups to a balanced XLR type microphone input. The Type 85 utilises high quality components and class A circuitry to ensure pristine audio fidelity and lowest possible noise floor. A ground lift switch further minimises noise and hum caused by faulty electrical lines. The Type 85 operates via +48 Volt external phantom power or 9 Volt alkaline battery. The Type 85 uses high quality discrete components into a single ended class A circuit resulting in smooth, pristine audio fidelity with low noise floor. Internal electronics are moulded into a solid epoxy block and protected against electrical damage. The outer casing is a single piece featuring extra thick walls. A ground lift switch eliminates noise and buzz caused by faulty electrical wiring. Pickup mode and Speaker mode switch allows -10dB and -46dB operation.